When you think of five-star, Italian fine dining, Labuan Bajo in Flores doesn’t immediately spring to mind – unless of course you have had the extreme pleasure of dining at celebrated restaurant, MadeInItaly. Chef and owner Marco Bertini’s passion and talent for creating outstanding Italian inspired dishes, using locally grown, organic produce, has earned him a reputation for excellence and a devoted following of food-lovers who travel from all over the world to dine at his table. His menu is an ever-changing tribute to the region, the freshness of the produce, and his skill as a chef as he turns out exquisite dishes that have diners coming back for more. Marco Bertini created the MadeInItaly restaurant and concept as a way of showcasing the best of his Italian heritage, and the exciting potential of Labuan Bajo and Flores. When he first visited Flores while on holiday, almost ten years ago, the landscape evoked happy memories of Italian seaside idylls, with towns nestled into the bays, built around a main port, and a simpler, more honest way of life where family and food are cherished above all else. The devotion to ritual and spirituality, a church-going culture, and joyful village celebrations for holidays like Christmas, all reminded Marco of his happy childhood in Italy. After traveling around Flores, and having spent a considerable period of his life living throughout Indonesia, he felt an immediate kinship with the peaceful coastal village of Labuan Bajo. On that trip, Marco was staying near the site of the first MadeInItaly restaurant, and could see the vast potential of the area overlooking the water, with stunning views of the phinisi, or ‘pirate’ boats as he thought of them, cheerfully hopping about the bay. He spent a day aboard one of these local fishing boats, and was instantly struck by the intense beauty of the national park, and the idea of being able to create a ‘floating restaurant’ that would pair his world-class food with the breathtaking coastline. It was a vision that would have to wait until the timing was right, and in the meantime, Marco focussed upon opening his restaurant. The new restaurant required his dedication and care but even in those early days, Marco would spend time drawing his floating restaurant and creating the concept, waiting for the right time to realise his dream. Labuan Bajo was quieter then, with only a few local fishermen and phinisi, and while others might have worried about the remoteness of the location, Marco could sense that Labuan Bajo was on the brink of exciting change. He was eager to be part of the push for a brighter future, while still preserving the way of life that so endears the place to all who visit. He had always wanted his own restaurant, and after getting the green light from the landowner, and much careful planning, he started renovations in June 2010, opening the restaurant in January 2011. In those first years, Marco sourced all of his ingredients by visiting the local markets each day, selecting only the freshest and highest quality produce for his restaurant. After two years trawling the markets every day, he realised his dream to grow his own produce, to exacting, organic standards, and now has two synodic permaculture farms that stock the restaurant and champion the ‘paddock-to-plate’ lifestyle. Planting and harvesting according to the cycles of the waxing and waning moon, he has one farm devoted to free range livestock, and one farm for vegetables, ensuring every dish is built around seasonal, organic, locally grown produce. His menus reflect his remarkable ability to take ingredients of the highest quality, combining them in ways that bring out their best, allowing each component to shine by amplifying their natural flavour and goodness. Six months after opening the restaurant, he met Johnny, a fellow Italian and frequent visitor to both Flores and MadeInItaly where he had sought out Marco’s incredible cooking. They bonded over their shared passion for good food, their love for the ocean-going lifestyle of Flores, and the many opportunities that it presented. Johnny was in Flores pursuing other business interests, and when those plans were unable to go ahead, Marco told him about his concept with the boat and as Johnny liked all of his ideas, he decided to join Marco in the project. Johnny requested that they add a cabin to the boat design, somewhere for him to stay each time he visited. The timing was right, and Marco’s long-held dream to sail the majestic waters of the Komodo National Park while enjoying exceptional food, the many hours he had spent sketching and designing his vision, was finally coming together. They commissioned the building of a boat from which Marco could conduct enogastronomy tours of the region, and more than just a commercial opportunity, it was a true journey of the heart for Marco and Johnny, who oversaw the boat-building project from beginning to end. With no experience in this area, they travelled together to Tana Beru, Sulawesi, and were pointed in the direction of a 75-year-old boat builder, reputed to be the best at his craft. Marco and Johnny both believe this man was put in their path for a reason, and credit him with building a beautiful vessel, a master-craftsman, whose pride and love for his trade matched that of Marco’s for his own calling to the food industry. Working together, they decided to change the design of the boat from a traditional Indonesian working boat, to a leisure craft that allowed them to skip smoothly between islands. They also changed the design of the boat to allow a cabin to be included that Johnny planned to stay in when he was visiting Labuan Bajo. Upon completion of the project in June 2012, they discovered that boats are launched in accordance with a particular set of conditions, the day, moon and tides, and waited (im)patiently for the day to come. They scouted the village for a captain to skipper them back to Labuan Bajo, and after finding one, docked the boat on dry land and waited for the night tide to come in and lift the boat from the sand. Johnny slept aboard that night, and after stocking the boat generously for the maiden voyage, they set off for home, unsure of what the journey ahead on an untested vessel would bring. But they need not have worried, as the boat was skilfully engineered, and they enjoyed the first of many comfortable nights under a wide, starry sky. The boat now takes awe-struck guests cruising and exploring the pristine waters of the Unesco listed 7th natural wonder of the world, the Komodo National Park. Chef Marco meticulously prepares a seven-course, set menu for his guests, taking them on both a tour of Flores, its seasonal produce, and fine Italian cuisine. Almost a decade has passed since a friend first brought Marco on holiday to Labuan Bajo, and he is still here, proudly calling it home to his world-famous MadeInItaly restaurant, boat tours, and permaculture farms. In June 2016, the restaurant moved to its current home on Jalan Pantai Pede; set back from the road and overlooking lush gardens, the restaurant embodies the natural elegance of its Tuscan design. 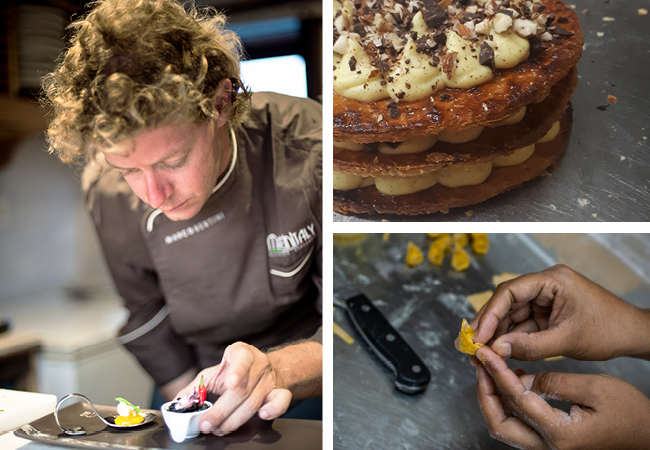 Driven by his passion for good food, Marco is unchanged by the accolades he receives and the world-class reputation he enjoys. He loves his life here in Labuan Bajo, the people, the culture and the joy he gets from growing and sharing his passion for Italian fine dining.